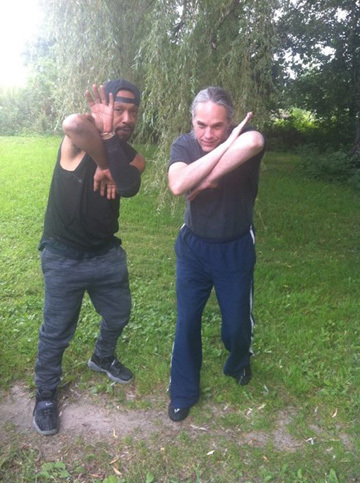 In 2015 Lyte Burly came up from NYC to visit us at Alliance Martial Arts and we spent two full days training together with a couple of our students. You can read about that get together here. * The signature 52 "Rolling Punch" and how it is different from regular punching because of the angle of delivery and visual signature! * An inside look at stance positioning and guards that enable you to take advantages of weaknesses your opponent has that they are not even aware of! * How to use the focus mitts "Shoeshine style" to develop offense, defense, and punch conditioning all at once! * The correct uses of Blocks 1-10 with all their counter punches so you flow immediately from defense to offense! * High speed drills that develop your evasive head movement while letting you stay close enough to strike your opponent! * Solo and partner sensitivity drills to help you feel what your opponent is doing and react to their energy without having to think! * "The Art of Deception" lecture: The scientific basis of why the blocks work to deceive the eye and trick the mind! Now this isn't a pretty video and won't win any awards for its camera work (the camera died after this shoot and had some issues with the auto-focus at times) so up to now it had just been available to a few 52 Blocks coaches. But if you want to learn what goes on "behind closed doors" and HOW TO TRAIN in the 52 Blocks then you won't care because you just want the information! And that's what we have here, a solid hour of drills and skills and a 20 minute advanced lecture that will change how you use your blocks forever. 52 Blocks is not a secret or a mystery; it is however a style that takes a lot of work and dedication doing the basic drills over and over again so you respond correctly under pressure. As Lyte says, "You don't just get up in the morning, eat a jelly roll, do Triangle Trade in the mirror once, and then think "I'm a 52 man", it doesn't work like that." So if you've been tracking on the other DVDs and all the YouTube clips Lyte and I've put up then you will want this DVD to add to your bag of tricks, your personal fighting style and evolution.